BERLIN REMIXING is the headline for the second MakeCity festival; a city-wide event that emerges from an urban context where land speculation has caused prices to rise up to 500% since 2012, in the city’s central districts, and where the municipal government has set unprecedented goals for new build social housing units over the next years. 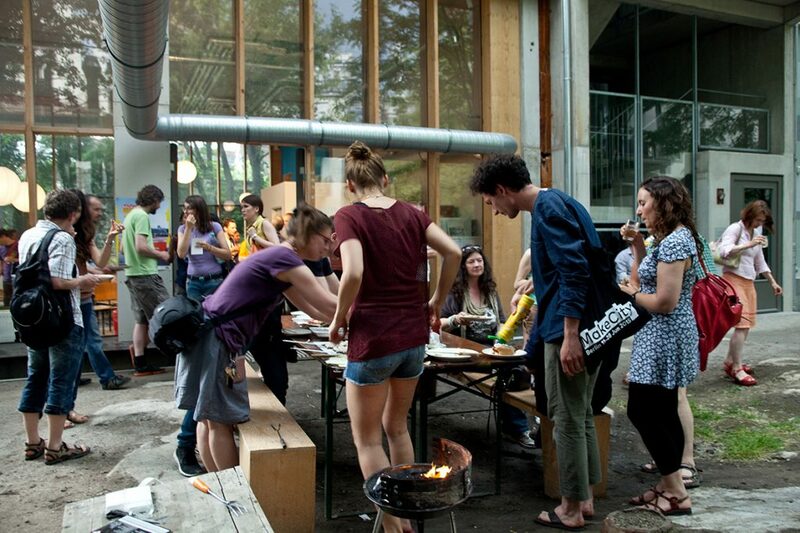 The integration of a recently arrived migrant population, politically active civic groups negotiating new concepts for cooperative housing and mixed-use developments, and innovative concepts to integrate urban production spaces in the urban fabric: all these current developments frame the MakeCity’s urban conversation. Berlin Remixing emerges from this context to make tangible the notion of a new social contract for cities; one that overcomes the notion of ‘top down’ vs ‘bottom up’ city planning strategies. Exemplary new coalitions, projects and processes drawn from an international scene that allow for innovation on many levels – material, process-based, in architecture and landscape urbanism, for cooperative cities – are featured during the 18 festival days. MakeCity is resolutely trans-disciplinary; bringing together architects, urban planners, leading municipal decision makers, urban designers and makers, and civic groups that are defining innovative strategies and new coalitions for change in cities. As a result, over 200 events – from exhibitions, workshops and excursions in cultural centres, workspaces, studios, production and maker spaces to international panels at the festival centre – have been developed by the festival’s partners. The Chamber of Architects, the Senate for Urban Development and Housing, embassies, NGOs, architecture practices, contested sites and new commercial and cooperative developments become sites for debate, discovery and exchange. Structures / Processes, examining innovative production cycles, the future of steering participatory urban planning processes, with a view to questioning the need for a social contract for cities, and new trans-sectoral alliances. The circular economy and the way in which non-linear production and re-use cycles can impact upon all our preconceived notions of urban design, lies at the heart of a fundamental ‘remix’ of urban design processes. Urban / Nature: We will look at the fundamental effect of climate change on urban infrastructures and landscapes, the evolution of hybrids that interlink grey with green infrastructures, ways in which food production in cities is transforming the urban fabric and generating new micro-economies – and third spaces for civic engagement. Architecture / Space: As an architecture festival, MakeCity will, of course, feature the built representation of all notions of remixing, re-thinking and re-negotiating space and form within the urban context. Ground-breaking models for wood-built urban architecture, modular systems, mixed-use developments that include ground floor spaces for production and further greater diversity and resilience on a district level. Fundamental concepts for financing cooperative developments, new models for shared ownership, cultural integration and co-living can be explored and discovered throughout the city. Find below a preview list of those involved with the Festival. Full programme will be uploaded in mid May!